The tips of the roofs are usually in the shape of flame-like nak (naga). The hand railing along the stairs at the entrance are often in the shapes of the nak. The paintings on the walls are from the Buddhist Jataka Tales. Plant and flower designs permeate the artwork often with lotuses and vines. The temple area are sometimes decorated with statues of additional beings, animals and deities from Buddhist literature. The smaller tats that you see along the walled perimeter are funeral monuments to the deceased. They often have the cremated remains interned inside them. The temple grounds consist of the main temple building (vat) where only the monks enter to pray; the sala where sermons and lay-followers congregate; the kuti which is where the monks reside and sleep; and finally the drum tower which contains the large drum and gong. The colors. 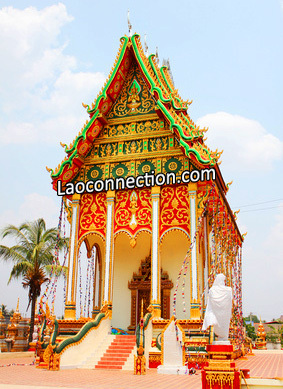 Red, gold, and green are often seen however it's not unheard of for some temples to take different artistic routes. The numbers of each items (number of layers on the roof, number of statues, number of windows). They all have significance.